The French have their paradoxes and so do Americans. Which was something I discovered over and over again while I was exploring New York with an especially inquisitive Frenchman in tow. There were lots of questions, like when watching television, it’s tricky to explain why there’s a commercial for people stuffing their faces from all-you-can-eat buffet for $6.99 suddenly followed by an ad pushing low-calorie frozen entrées. Or on that note, why in America, a main course is an entrée – since that means “before” in French? I tried to explain how so many men put themselves on television and talk freely about how they couldn’t perform some of their, um, manly acts in front of millions of people on talk shows. Or what makes a presidential candidate go on television, rather than the church, to pray “for the economy.” And why the people cooking on television talk non-stop while they are preparing dinner. (And this is from someone who talks non-stop, no matter what he’s doing.) There were videos in the taxis featuring Broadway shows, magic bras, and Larry King, one right after the other. In spite of all the paradoxes, there are a lot of great things about America that we take for granted: the bountiful greenmarkets, the unexpected scenic vistas, our friendly openness, and the “can do” attitude that are some of our best traits. In addition to my duties as an ambassador to New York City, I was also in charge of the food. Which was a great because I had a bunch of new places to check out and a few older ones that I wanted to revisit…. Luisa said that Back Forty was a good place to bring Europeans and she was right; people often don’t realize the charm of America when they come to visit, preferring to see Times Square, museums, and other sites, while not knowing (or bypassing) the fantastic greenmarket and tucked away places like this. I mean, you’re actually eating in someone’s backyard in the middle of one of the most urban cities in the world. How cool is that? 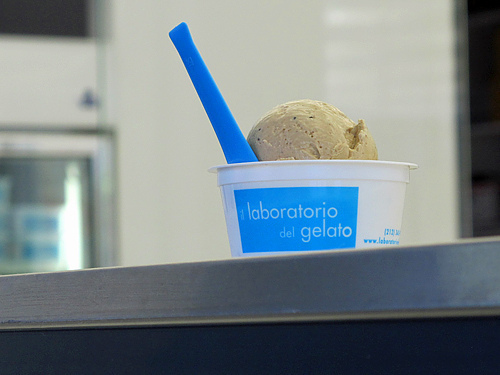 Il Laboratorio del Gelato has opened an ultra-modern gelato “laboratory” which is immense and I was surprised – and happy – to see so much space devoted to my favorite things: house made ice cream and sorbets. 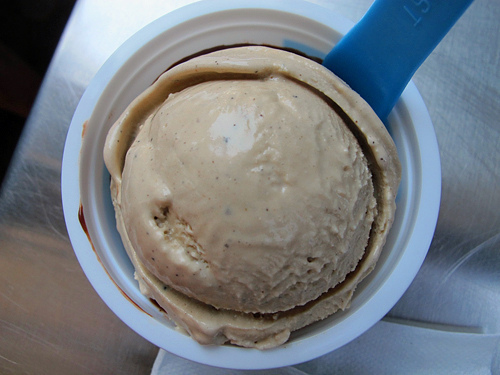 There were lots of flavors to choose from, including acacia honey, fig, and sesame seed, but being a traditionalist, I stuck with coffee atop a scoop of chocolate-chocolate chip. And for those who think the French are too refined to eat with their hands, the person splitting the cup of ice gelati with me wiped the cup clean with his fingers and pronounced the coffee ice cream the best he’s ever had. So take that, Berthillon. 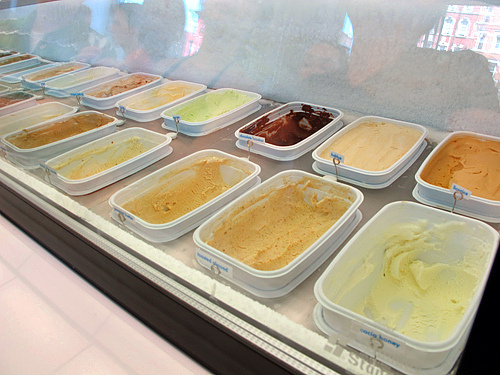 Aside from people eating ice cream with their fingers, another thing you won’t find easily in Paris are paletas. Fany Gerson is the author of a nifty book on paletas, Mexican ice pops, and I hit the stand of La Newyorkina on the High Line walkway during one of the blazing hot days of August. Right before it was my turn in line, they ran out of lime (merde! I guess that’s why the French are so adept at line-jumping…so they get what they want before they run out), but there was fresh coconut, mango-chile, and strawberry and cream to choose from. 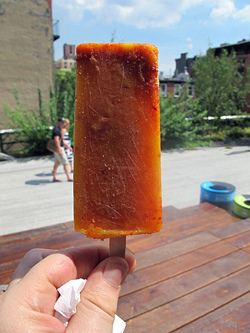 I chose the mango-chile since it seemed the most cooling, but I had to lap quickly to keep it from melting as I walked in the unrelenting sunshine while trying to admire the New York skyline and eat my ice pop. 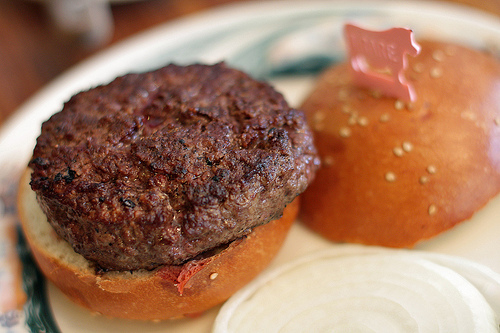 My burger, which I ordered rare, came out a little more cooked than a steak house would probably normally serve, but there’s a funny divide in America between people who like their burgers red and juicy, and those who like them well-cooked. (For some reason, the French think all Americans like well-done meat and I’m never sure where that comes from, but perhaps it’s the half that likes it that way tend to travel to France more often.) 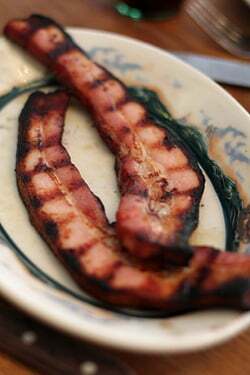 The fries were really great, and so were the grilled bacon strips. Oh yeah, and the company was swell, too. It’s hard to imagine a more urban city than New York, which also boasts an outstanding greenmarket in Union Square. Whenever people in Paris tell me the reason we can’t get very much locally grown produce is because we’re in a big city, I raise an eyebrow because if New York can do it, I can’t see why others can’t. There’s also vendors dotted around Manhattan, from small parks to the Staten Island Ferry terminal building, so even if you’re a commuter or live elsewhere, you can still have access to fresh, local fare. We did the majority of our shopping here and a certain someone, who is rarely speechless, stopped in his tracks when surrounded at the rows of colorful heirloom tomatoes, dozens of varieties of fresh herbs, and bins of uniquely striped eggplants. 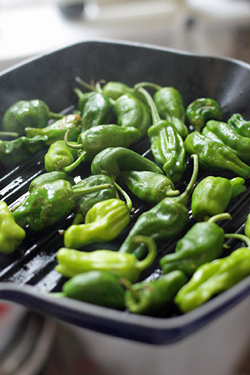 I picked up a pound of padrón peppers and as someone who doesn’t even like peppers, I took my other half completely off-guard. 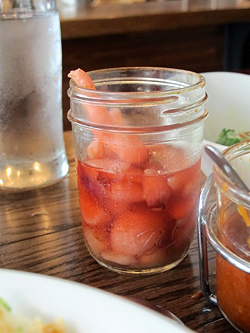 But ever since I had them at Nopa…and loved them, I was anxious to roast some off myself and introduce them to Romain. 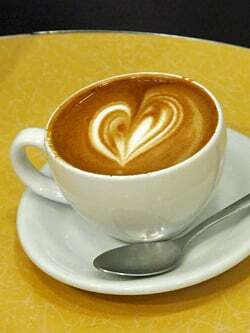 Equally intriguing is the coffee culture in America, and it’s hard to go into a coffee shop nowadays and not have to choose from a number of different kinds of coffee, classified by origin, extraction technique, roast, and sustainability. Joe the Art of Coffee is one of the best in New York, although like most (caffeine) addicts, everyone seems to have their own accro. Another addiction that I share with quite a few others are the pretzel croissants at City Bakery. These salty, buttery, flaky twists are pretty good for breakfast, although I like them as an afternoon snack since they do double-duty as sweet and savory. 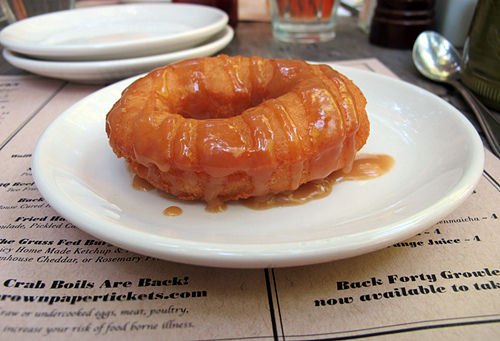 They’re really astoundingly good and no one should go to New York City and not try one. I had lunch with Melissa and Carrie at Momofuku Ssäm Bar which at lunch, now features rotisserie duck and snack-sized food. So when I asked Melissa where I should go yet another Asian-inspired meal, she suggested Baohaus, which she said she hadn’t been to heard raves about. So the following day I met up with Deb for gua bao (upper left) and it’s interesting that even humble “stand”-style eateries in New York City are now boasting they use free-range chicken, organic tofu and Berkshire pork. Interestingly, we liked Uncle Jesse the best of all the steamed bun sandwiches on offer, but if you go, be sure to try the Sweet Bao Fries, which I didn’t look at the menu too carefully when ordering (I thought we were ordering sweet potato fries). But out came a basket of deep-fried bao with a sweet black sesame dipping sauce, meant for dessert, although I ate them in between bites of the savory bao sandwiches. On the other hand, I was walking by Vanessa’s Dumpling House another day, a place noted by many for their inexpensive dumplings (upper right), and decided to pop in and try them. Four pork-chive dumpling cost just $1 and it’s hard to beat the price. But I didn’t really taste anything that reminded me of “pork” (or chives) and I was kind of wondering what ingredients were used to make them cost so little, and I didn’t finish my dumplings. It’s be interesting to see what could be done here using similar ingredients to Baohaus and other places, and even if they had to triple the prices, it’d still be a bargain. 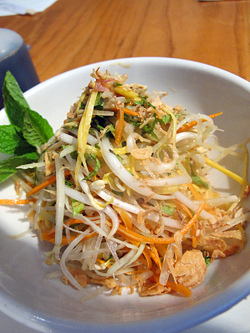 Another Asian place that we loved was Republic, right on Union Square. A multitude of readers recommended this place when I asked on Twitter where to go for lunch one day in this neighborhood. Aside from the thundering noise inside (note: If people three tables away can hear you, you’re talking too loud), the food was lively and fresh, spiced right, and absolutely delicious. 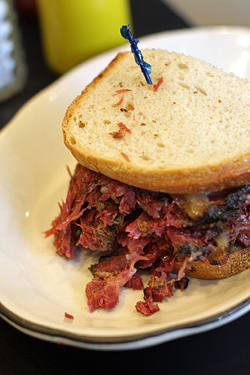 But the one thing that remains elusive in Manhattan is a great pastrami sandwich. The last one I had at a famed deli was so tough, gristly, and inedible, it made me swore off trying to find a good one in the city. But a few people told me about Pastrami Queen and since I was staying in the neighborhood, we saved that for our last meal. Although they were not overly generous with the half-sour pickles, they probably heard that I could eat a giant bowl of them, so prudently only gave us each a half of one (plus two of the other kind of pickles, which I don’t like nearly as much). But when the sandwiches came out and we both took our first bite, we had to agree that they were – as they say in France, pas mal, which is a compliment. The pastrami was sliced in smaller pieces, rather than long strips, which made our sandwiches easier to eat, although the meat was so rich and a bit fatty, that I could barely finish mine. But then again, I could just buy one of those low-calorie entrées (or plats principaux), which would mitigate all the pastrami, hamburgers, fried chicken, bao, pretzel croissants, dumplings, and ice cream that I ate while in New York—right? You’re missing out on all the secret eats! You still need to pay a visit to the bbq cart under the Manhattan bridge. Best snack in the city. And also visit my husband’s restaurant. He will kill me for saying that. Great post, makes me want to go back to New York so much! The entre thing has always confused me too, were you able to come up with an explanation? 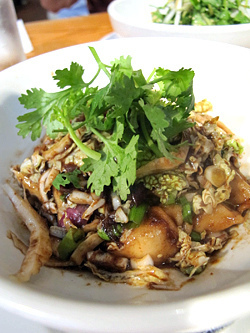 Great recommendation on Republic – love their noodles! I know of the famed deli with the inedible sandwich. I think I was with you, no? I hope this version was better. Your recent posts are really getting me geared up to EAT since we’re moving to NYC in one week. I thought nothing could beat Paris, or Rome, but NYC is quite possibly the food capital of the Universe! New York is the one city, I have yet to explore with my family. Images like yours make me want to book the tickets today. 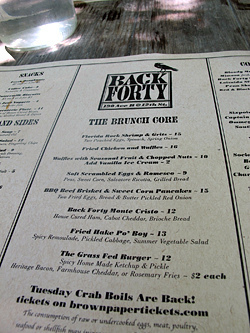 I had dinner at Back Forty a couple of months ago and it was very good. Have to agree about the donuts though. 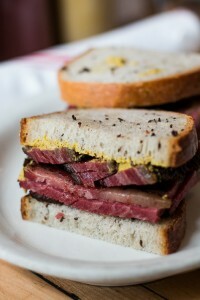 Love Momofuku too and must remember to visit Republic and Pastrami Queen on my next visit to NYC. So many places to go! The greenmarket really is astonishingly wonderful. Sounds like you and Romain had a great trip all around! You should have tried the duck sandwich at Vanessa’s. It’s amazing. so much food! so little time! David, you make reading about New York and the food there as exotic and interesting as reading about Paris. I used to live there and don’t return very often, but you make me want to jump on the plane and head straight away to one of the eateries you visited. 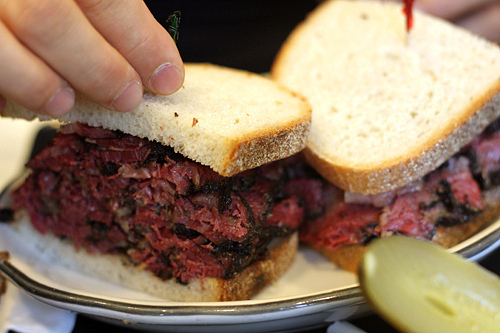 As for pastrami, Los Angeles, my home, surprisingly has it all over New York. I invite you to come out here and try Langer’s, where the pastrami melts in your mouth like butter. I’m sorry you missed Mile End in Brooklyn — they have the BEST smoked meat sandwich ever – montreal’s version of pastrami. YUM! Jean Marie: I don’t know what’s up with those doughnuts, but ours was really dense and doughy. I think if they’re going to go through the trouble to make them, they may as well come up with a recipe for success! Katie K: I just read about that, except everyone kept saying the dumplings were so good as well. It was interesting to see and the duck sandwich sounds like something I would like. Add my vote for Il Laboratorio! Stopped in after a visit to the Tenement museum and had their mint ice cream. Revelation! Got me on a homemade ice cream kick for a few years. The museum is a great place as well, worth a visit (especially knowing there’s great ice cream next door). At Vanessa’s, it isn’t the dumplings that are so great, but the little sandwiches of duck and other meats on fried sesame bread. Check those out next time. It’s always best to do these food tours in beloved cities with a “foreigner” having to explain why stuff is the way it is without just accepting it always makes for more interesting eating. You made me miss my West Village apt just a bit. I might have to nab a Mission burrito on my way home. OH MAMA that pastrami sandwich looks delectable. And to answer your question, America >>> ketchup. It’s one The only thing is that America seems limited to bright yellow ballpark mustard. If we could somehow get whole grain mustard to catch on, that would be GOLDEN. As always, thanks for the entertaining and informative post. Pastrami, calling my name now. What a timely post!! My friend and I were just “discussing” the chicken and waffles situation. She has never heard of it before and thinks that I am making it up. I don’t quite understand it either but know that it is a popular dish. You certainly did pretty well for yourself, and darned if you didn’t manage to hit several of my very favorite spots along the way! Everything looks great, and it sounds like a good time was had by all. Since you explained to Romain, can you explain to me why waffles are served with fried chicken? Because I’ve lived in America my entire life (except a summer stint in Dijon), including the deep south and rural Midwest farm country, and I have never seen waffles served with fried chicken. Actually, I can’t fully explain it either. This was the first time I tried the combination. I think if the waffles are crisp (and perhaps studded with crispy cornmeal!) it’s kind of like having corn bread with fried chicken, which I would imagine would taste really good. I’ve heard that Pies ‘n Thighs in Brooklyn does a good version and next time, I’m heading there to try it out. You really covered all the bases, huh? But I can’t believe that Berthillon has finally met its match. I will have to try Il Laboratorio to see what’s up. Cheers! They’re both quite different (for example, I don’t think you’ll see sesame seed or peppermint stick ice cream at Berthillon any time in the near future…) but he was really licking that cup clean and loved the ice cream. David why do you do this??? The food looks so beautiful, it makes me want to write poetry. You really must have a clone–one is out eating, taking pictures and having fun, the other back at the keyboard blogging away. Another great post–thanks! 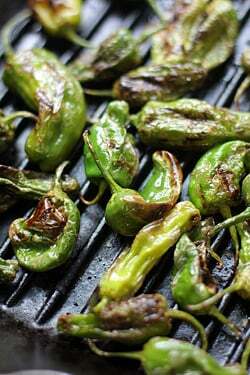 Here, you can order from your home in Paris all the “pimientos de Herbón-Padrón” you like. Much cheaper than going to Napa for sure!! The chicken and waffles combo I believe began when hungry jazz musicians ordered the combo after a late night ‘set,’ out of a desire to combine dinner (fried chicken) with breakfast (waffles). 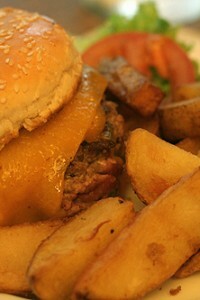 And the combo of crisp exterior and creamy soft interior kind of explains the appeal of both foods (and fries as well). This is definitely one for the bookmarks folder! A suggestion: An American in Paris had a lot of interesting comments to make. I won’t try to add too much to the why of the chicken-n-waffles conversation, but M&G’s have my favorite. So, why is waffle served with fried chicken? It looks delicious though.. Thanks for a few chuckles, bringing a smile to my face & a sweet brief respite. I’ve been asking for years about America using entree for the main dish. Closest I’ve heard is that Americans thought entree a more chic word than plat! 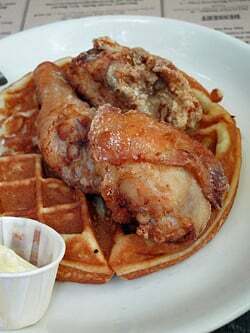 Chicken and waffles is an old, old regional American classic. Mostly Southern, or Southern-Midwestern. Though, I seem to recollect that in the recent production of Mildred Pierce on HBO, Mildred served chicken and waffles at her restaurant in LA. That story takes place in the 30s. It’s kind of like chicken fried steak, weirdly good. David, 20 years ago we moved from Manhattan to NC and life has not been the same since. And from what I just read, New York City is not the same – the restaurants you mention, with the exception of one of my very favorites, Peter Lugar, didn’t exist nor did the myriad of bakeries and specialty food shops. It’s been eight years since I visited “home” and unfortunately I’ll never make it back. Reading this post brought tears to my eyes but a lift to my heart. Thanks much. By the way, dinner at Lugar’s is a wonderful treat and they make the most delicious chocolate mousse on which they PILE up the whipped cream – when we ate there we made sure to leave room for dessert and had leftovers for the next day. What I liked best about this post was that you conveyed French ‘tude while showing off your home land. You managed to show me your trip through both an American’s and Frenchman’s eyes. Oh– and that I now have added to my to-try list in my own city: pretzel croissants. But please, when you come back– come with us to Luger’s for dinner. That’s what they are known for and that is when they excel. I don’t get chicken and waffles together either. Oh, I know there’s a story, and I really wish someone would explain it to me, but I also know that if the place is famous for making the food it makes I will order and consume chicken and waffles together gladly. Also, I’m extremely jealous of the fact that you two can eat everything you want! No problem! No worry about gaining weight! Not that it stops me, mind, but I am jealous. Oh, hey, that photo of pupatelli! 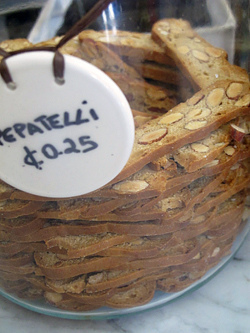 Hard, almondy, honey and pepper cookies that are always a part of Italian Christmases. Nice to see someone other than my mother’s people make them, too. Thanks for that! 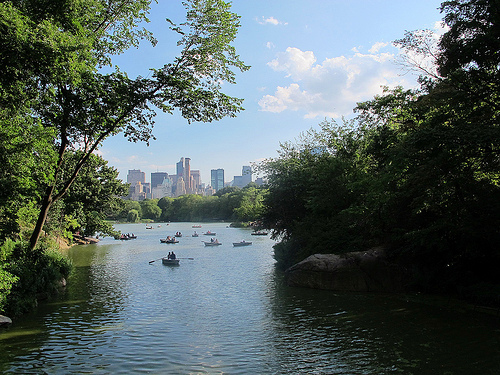 We all have Frederick Law Olmsted to thank for the lovely vistas such as that in your last shot. 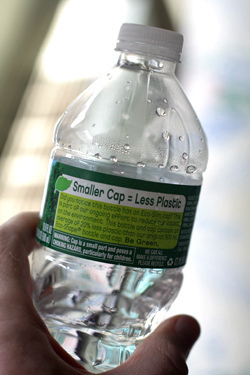 The “smaller cap = less plastic” label on the plastic water bottle leaves me speechless. Comical and despicable at the same time. Lisa: I know, it was kind of funny. Some say that all these “green” things are to make us feel less-guilty for using certain things (like bottled water.) That said, it was odd when I took a shot of the bottle of water since I had bought it. But I do try to avoid buying water anymore unless I’m traveling and there aren’t other options. 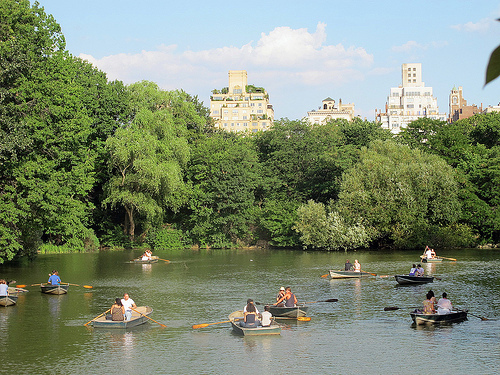 Nancy: He did a great job…Central Park really is magnificent. I am so happy that you got to go to Pastrami Queen!!! I love their pastrami!!! What drives me crazy about this whole “green” thing is that people, when they do make the minimal effort to recycle, don’t bother taking the caps off the bottles! This negates the whole point of recycling since NYC doesn’t accept bottles with caps on, they just throw them out rather than take the extra time for the sorters to take the caps off. Makes me sick. If I do have to have a bottle of water, I reuse it and then recycle it. Sometimes I will go through my building’s recycling bin and take the caps off the bottles, but sometimes I get too grossed out. Chicken and waffles are delicious – especially with maple syrup that is real maple syrup. yes, Maryford…I just finished reading Mildred Pierce and about her chicken/waffle success in the 1930’s. OK, now I want some. 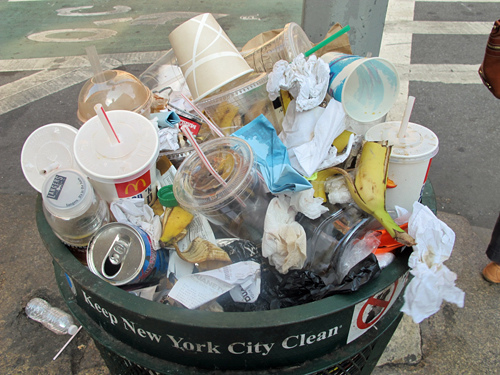 And thanks, DL, for the picture of a typical NY garbage can on the street. Huge statement. No wonder the Brits gain an average of 8 pounds when they visit New York. I just gained that reading this and I LIVE here! 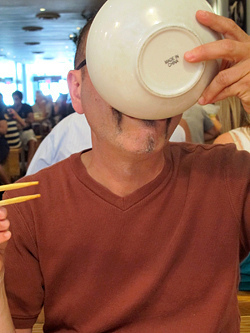 Could your next book be on NYC eating svp? For people who say you can’t grow produce in the city, I am sitting looking gleefully at my big potted grape tomato plant that is full of limbs bowed down by little red tomatoes, all with nothing more than about two hours of sun from my kitchen window. And finally, David, I was planning to see you at Babycakes on Wednesday, but someone wanted to see an apartment right in the middle of your scheduled visit there (amongst other things, I’m a real estate agent). Then she didn’t show up!!! I started crying as I trudged home through the rain, not so much because I didn’t do a deal, but because I was so sorry to have missed you…(okay, and also because I didn’t do a deal and that was the second time that week I’d been stood up). You know what David? You might singlehandedly be able to bring peace to the world by bringing together world leaders in a world cookout demonstration featuring each enemies’ (ha!) 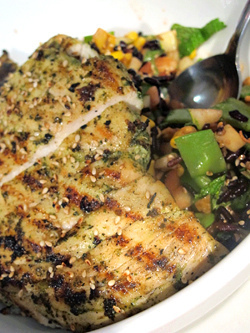 favorite dish and thereafter offer it up at a sit down peace making dinner. Who could possibly be mad after so much good food and good will? There you have it, Mr. Int’l Ambassador extraordinaire, you’ve found your new calling! I visited NY for the first time in March and ate at some of the places you recommended during your last trip, thanks for pointing us in the right direction. My husband is still talking about the hot chocolate at City Bakery five months later and I think my favourite place was probably Il Laboratorio. I loved the yuzu sorbet and black sesame icecream and their Guinness ice cream was just brilliant, right up there with Momofuku’s corn cookies. You should try This Little Piggy Had Roast Beef (east village). It’s one of those sandwiches that is so good that you can enjoy it just by remembering the taste. Regarding dumplings: go to Fu Zhou Cuisine, which is on the SE corner of Eldridge and Broome (same block as Vanessa’s assuming you went to the original shop). Probably the best non-fried dumplings in the city: I’m not sure if they’re boiled or steamed, but they’re on the lighter side, about two bites each, and have a higher chives-to-pork ratio than most of NYC’s dumplings. 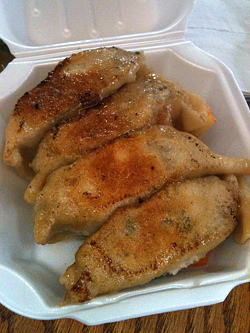 And they’re great with the watered-Sriracha/soy sauce combo that most of the NYC dumpling houses have. looks like a fantastic trip. my mouth is watering! David, you should try Prosperity Dumpling for great, juicy, flavorful guo tie. And you really need to make it to Queens some day. 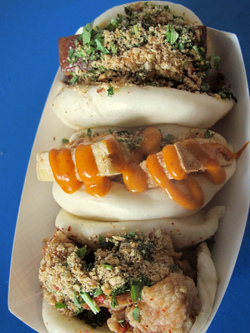 Then you can really enjoy great gua bao! I haven’t had chicken and waffles and didn’t understand it either. Then I was at Yoder’s, an Amish restaurant in Sarasota, FL. I had the fried chicken and corn bread. The corn bread was the size of a large pancake. The “sauce” for it was like syrup. That’s when I realized this was sort of like chicken and waffles. Whenever I visit my friends there, we go to Yoder’s for the fried chicken – a quarter chicken is HUGE – it takes up the entire dinner platter. As for a hamburger with mustard – I always put mustard on my burger. I skip ketchup because it’s too messy. After reading this post, I am ready to hop on a plane and eat my way through NY. I thought it was unusual that the waiter was surprised at my request for mustard. 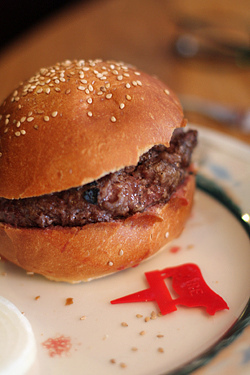 But I generally prefer tart, spicy things on burgers like mustard, onions, and pickles. The mustard they put down, they told me, “It’s English”…and it was super-hot, from a large dose of horseradish in it. 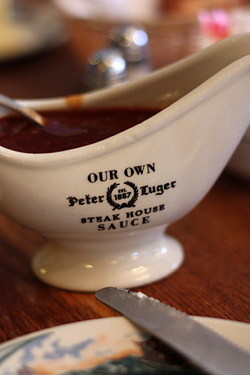 When tried the lunch burgers at Peter Luger’s we had to send them back because they were medium rare verging on well done eather than rare, like we had requested. Our waiter was pretty intimidating and it took the four of us some guts to ask. They however brought us more rare ones. I was told by some people (not from the restaurant) that restaurants in New York weren’t serving rare meat anymore because of some laws against undercooked beef. Am not sure if that’s true or not. But since they specialize in beef, they should be cooked as ordered or else noted somewhere that they can only cook beef to a certain doneness if required by law. Wow! Great eats in new york! Yeah that’s really interesting, the different cultures. It’s amazing how different the French and even the Americans eat, they have a more so strict way of eating at the table. Someday I’d like to actually with there to experience the differences. I always order my burger at Dumont med-rare and sometimes it is more on the rare side and sometimes is more on the done side. I think it depends on the cook – even though that’s not how it should be. Love that some restaurants in France won’t serve quality beef well-done!!! Oh, and my husband puts mustard on his burgers. He prefers Maille. David have you seen City Maps yet? It compliles every block in the city with and interactive map. 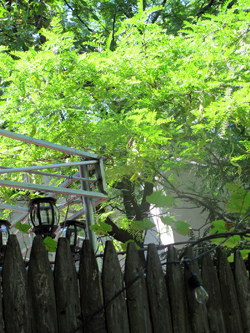 Its could lead you to some great, hidden eateries. Not sure why you think this was cute. There is absolutely no relationship between people being kosher and being Orthodox and observing the sabbath. In fact, I’m not sure I know anyone that observes the sabbath but I do know people that keep Kosher. Dumplings?? Next time, you MUST try Prosperity Dumpling (Eldridge street between Canal and Hester streets), which runs rings around Vanessa’s any day… also, you get FIVE for a dollar! 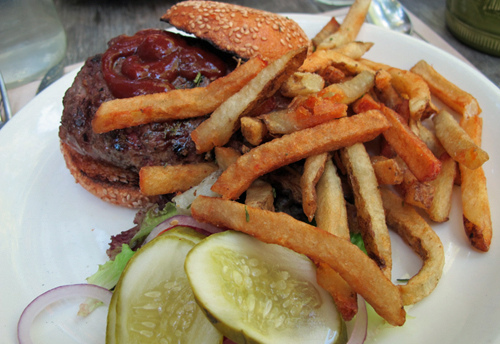 I now understand why New York has been described as: “The greatest city in the world” – because of the food! The portions might be HUGE, but everything looks delicious. Thank you for the comprehensive article. I think you convinced me to visit New York as soon as possible. I can’t wait! I love NY… I love food… and i love your posts!!! First i must say, as good as NY delis can be, nothing beats a pastrami sandwich from Langer’s in Los Angeles. They slice the pastrami by hand, and they don’t use typical pastrami meat. I watched a documentary on pastrami (could you believe it?) and Langer’s pastrami is actually from the animal’s naval. I don’t understand it, but it is. And if your game, they have a fantastic reuben sandwich (or Langer’s #44 – http://www.flickr.com/photos/ddkim/4292002125/). 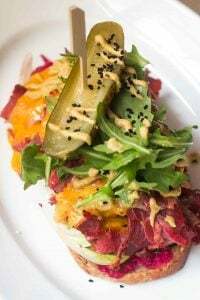 Why doesn’t anyone in NY grill the reuben sandwich? That’s what makes it soooo delish! Next is Peter Lugar’s. Their apple strudel with schlag is outstanding and a must! 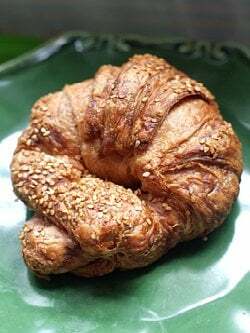 Finally, your pretzel croissant. I want one… now! Great post David! As a Southerner living in New York City who will be hosting a Brit it’s great to hear some of the things we just take as normal that they will find quite strange. The perspective helps shape the list of places to add to the list of “to do’s”.